A classical computer holds information in bits. It is comparable to a series of switches that can be either off (0) or on (1). In a quantum computer, the fundamental unit is the qubit. A photon or electron is usually used for this. It is similar to a bit, using its spin, it can be in a 'down' spin (0) or an 'up' spin (1), or it can be both at the same time, a superposition state. This property is unique in quantum mechanics. Because of superposition, a quantum computer can process a problem much faster than a classical computer can. Instead of solving a problem or initiating a process one step at a time like a classical computer, a quantum computer can do it all in one step. For example, a classical computer will dial a million numbers one at a time, a quantum computer will do it all in one step. In theory, it can calculate the value of Pi almost immediately. This is what makes quantum computers special. Not because it can process things much faster but because of its superposition property, it can solve problems classical computers cannot like factoring currently unfactorable numbers, breaking codes or predicting the behavior of molecules. One problem scientists are encountering in building a practical quantum computer is how to build one with enough qubits in it. At this time, they have managed to build quantum computers the size of a room with just few single qubits in it. At the most, the current quantum computer can do is factor the number 15. Princeton physicist Jason Petta and his team developed a method that allows the quick and reliable transfer of quantum information throughout a computing device. This opens up the possibility of having more qubits crammed inside a quantum computer. The research was reported in the journal Nature. "The whole game at this point in quantum computing is trying to build a larger system," said Andrew Houck, an assistant professor of electrical engineering who is part of the research team. 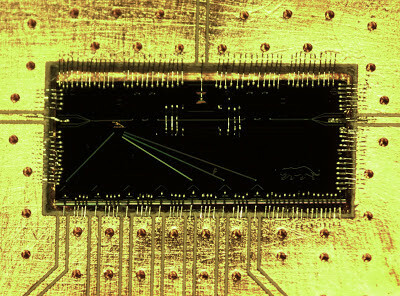 A major problem in quantum computing is how to transfer the information in the qubit to a device. Electrons are highly sensitive. Even a glimmer of light can destabilize its spin state which can create errors in the system. The Princeton team used a quantum dot to trap a pair of electrons and analyzed it using microwave photons. A quantum dot is basically a nano-scale semiconductor that captures light (photons) and converts it into energy. As the photons go through the quantum dot, the state of the electrons inside it affect the state of the photons as it exits the quantum dot. "We create a cavity with mirrors on both ends – but they don't reflect visible light, they reflect microwave radiation," Petta said. "Then we send microwaves in one end, and we look at the microwaves as they come out the other end. The microwaves are affected by the spin states of the electrons in the cavity, and we can read that change." They first created a quantum dot within a nanowire they called a "nanowire double quantum dot" (DQD}. This holds the electrons inside. The team then created small "cages" along the wire where the electrons will go to depending on their spin and energy level. A microwave channel is then built that houses this quantum dot. The microwave channel uses optics to read the position of the electrons and transfer the spin information from the dot. 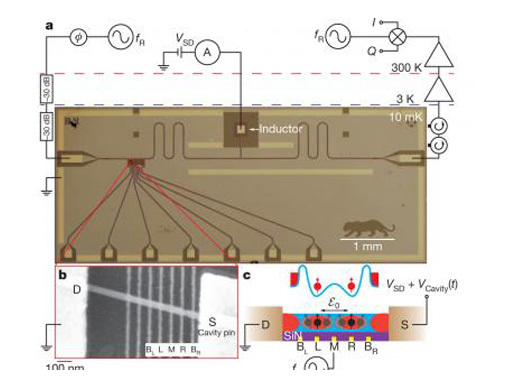 But analyzing small numbers of spins is not enough; millions will be required to make a real quantum processor. Petta said they are now looking at improving the reliability of the setup for a single electron pair. After that they can add more quantum dots. "The methods we are using here are scalable, and we would like to use them in a larger system," Petta said. "But to make use of the scaling, it needs to work a little better. The first step is to make better mirrors for the microwave cavity."